This photo of a very pensive looking Mr Swann Whiffin is currently part of the National Trust’s Fox Talbot Museum’s collection (previously mis-labelled as ‘Sroam Whiffin’). 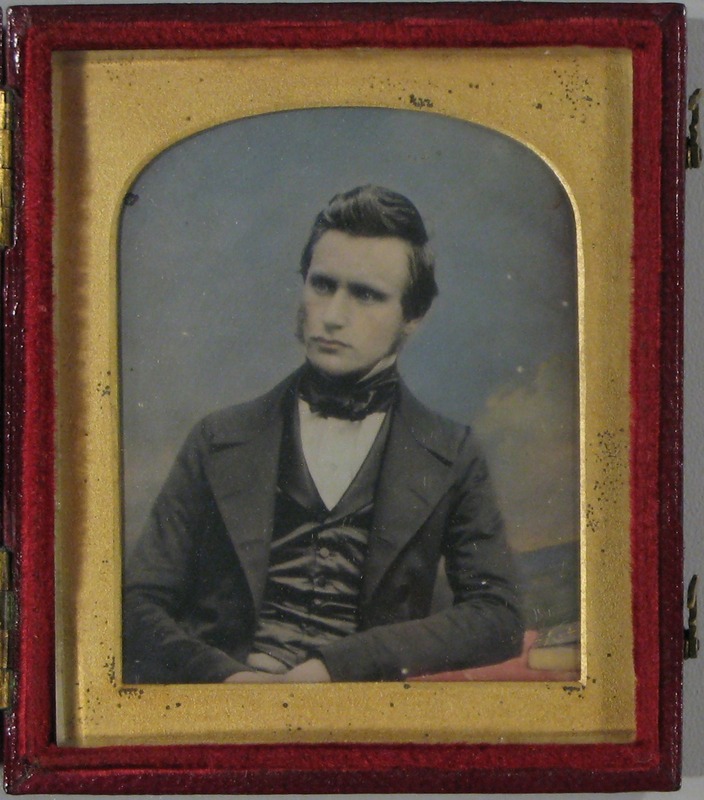 However this Daguerreotype was originally kept by Susan Elizabeth Mallet in a specially made cloth bag. The couple had been engaged, then unengaged (disengaged? ), then engaged again 10 years later, then, finally, they married in 1873, the year after Susan’s father died, when he was 50 and she 40! So it seems it was her father who opposed the ‘match’, such a shame that they had to wait so long, when it was to be so short lived. It seems strange that he would be so opposed to a man in the same trade as himself on pecuniary grounds, as both Swann and John Mallett were Chronometer makers. I can only assume something happened to make her father oppose the marriage or that Susie’s father was particularly tyrannical when it came to marriage, as her only sister also remained unmarried. As their mother died when they were quite young; by 1841 Susan is away at school and her sister Henrietta is at home with their widowed father. What makes it even stranger, however, is that Susan’s brother John marries Swann’s sister Margaret, albeit away from home in Kent where the Whiffin’s live. Perhaps it was this initial marriage that he was really against and Swann got tarred with his sister’s brush, so to speak! There are no baptism records for the two girls online and as John is not an uncommon name I can’t be sure of their mother’s name and exact death date, but regardless his opposition to marriage could have been related to not wanting to lose either the surviving feminine part of his wife or the help around the house! The explanation for Swann’s unusual first name is as follows – Swann’s mother was Mary Ripsher born in Cambridge – her father was Swan Ripsher, and his mother was Sarah Swan. In the records for them only one ‘n’ is used, but he always used 2, and the transcriptions of the earlier records could be wrong as I haven’t seen the originals! Poor Swann dies within a year of finally marrying Susan, and I was saddened to see he ended his days in Bethlem (Bedlam) hospital, dying almost a month to the day after his admission. It states that he had been pledging money and dowries to relatives and friends, convinced he’d found the ‘four leafed clover’ (perhaps the reason Susan’s father had given WAS money) and was anxious and unhappy. When reading through the records and the post mortem I noticed 2 things; this was his first ‘attack’, and the doctor had written his brain was ‘pale and bloodless’ in the autopsy. Now, at first that sounds like a bit of quack doctoring, but essentially he’d actually died of a heart attack, his arteries were clogged up, and there was a large amount of liquid in the chest, so to note this stood out. So I investigated heart attacks and delusion, and up came interesting results. People on forums across the interwebs had been experiencing this with their own relatives and were pointed towards a particular cause: an Anoxic Brain injury – where oxygen levels in the brain become so low brain damage occurs that can cause delusional and irrational behaviour, as well as depression and anxiety. It is not always permanent, but in this case, it seems Swann was too ill to have time to recover. Although of course this is by no means certain, it seems a good bet to me, and is probably not something widely known at the time, or that poor Susan could have comforted herself with. 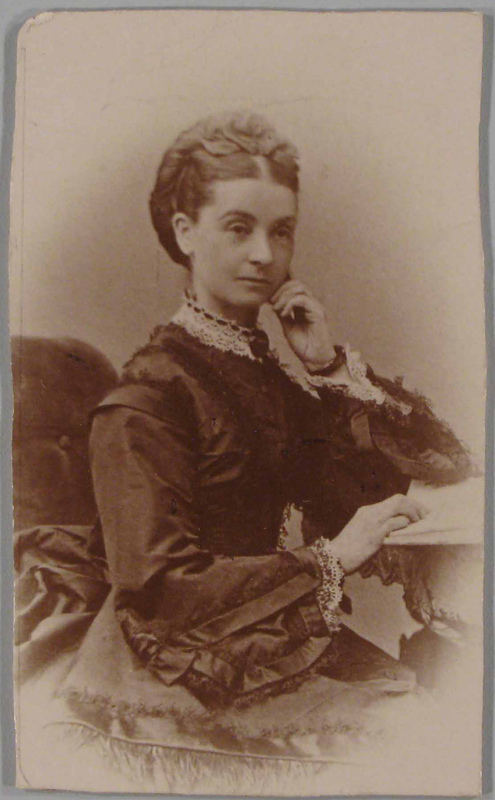 Something that was quite sweet that I came across during my research – was in 1861 he has a servant called Theresa Huxtable, and in 1871 she has one called Salome Huxtable – I haven’t looked into it but I like to think they kept in touch via related house servants, hehe! Although with married siblings they must have had other ways to communicate, you would hope!I hope to be able to see the photograph of Susan one day, I have a picture of her in my head, and would love to know if it matches the truth. Love the story. I’ve a feeling I’m going to be following your blog. Thought you might like to know your blog got a mention on my blog. I hope it brings you some more readers. Your blog is fantastic…some of these names are simply beyond belief!!! I just wanted to tell you that I stumbled across your blog as part of my “annual” web searches for Swann Whiffin. I’ve been doing them for nearly a decade. I have Swann’s restored long-case shop clock/chronometer, used to show off his mechanical expertise and calibrate his chronometers before they were shipped out to customers. His chronometers were used in prominent observatories and by the Admiralty to map the expanding British Empire. One of the things that drew me to his clock was his unusual and obscure name (as a clockmaker). I’ve assembled very limited bits and pieces of data about his professional life, but never details of his personal life. This is a wonderful, albeit tragic, love story. After all these years, I never thought I’d be able to find a story like this during my web searches. Your research skills that are clearly superior to mine. While I’m sure it wasn’t the intent of your blog, you’ve made an inanimate object, created by a fairly obscure person in the distant past, truly come to life. If you don’t mind, I’ll keep a copy of your blog posting on Swann inside the clock, so long after I’m gone, your blog will still be telling the story…. P.S. If you ever come across that picture of Susan, I’d love to see it. It’s so great for me to know there is someone out there looking after and appreciating some of his work, it seems he was indeed skilled and respected – which makes his personal life all the more unusual! As it happens I just very recently received a copy of her picture, I hadn’t got round to posting it yet but will do so now! Hers was taken a few years later but they would have been a very striking couple. Thanks for posting the picture of Susan!!! What a great post, and such interesting research, to find someone who actually has a chronometer made by Swann Whiffen, and to be able to link up with his life story.